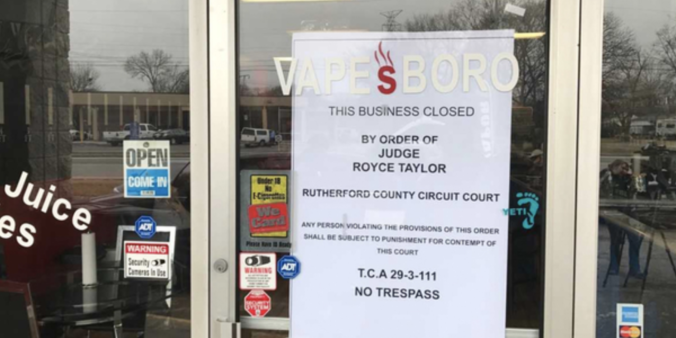 MURFREESBORO, TN – In what is being hailed as the largest drug crackdown on the District Attorney’s chalkboard to-do list, authorities padlocked twenty-three stores in Rutherford County on Monday accused of selling products containing Cannabidiol, also known as CBD, a canniboid oil that is moderately more mind-altering than your typical over-the-counter pain medicine. Just last month, Governor Haslam unveiled a $30 Million plan to combat the opioid crisis in Tennessee, but Rutherford County law enforcement authorities were smart enough to realize that Tennessee already has its opioid epidemic completely under control, choosing instead to focus its efforts on preventing the spread of low-THC candies. Lincoln’s statement is supported by a recent Murfreesboro Tribune survey, which revealed that zero percent of Murfreesboro Tribune writers could properly articulate what CBD even stood for without polling the audience of phoning a friend, despite one hundred percent of Murfreesboro Tribune writers having a personal connection to the opioid crisis. Law enforcement officials emphasized that the seized CBD products will be taken off the street for good. In the time it took to write this article, another Tennessee citizen likely died from an opioid overdose. But, sure, let’s get out there and stop those CBD gummies from destroying our communities. Love the sarcasm, it is deserved. I can’t think of anyone getting high or dying from CBD Oil. However the number of people dying opioids, fentanyl and meth? Those deaths have been called an epidemic.